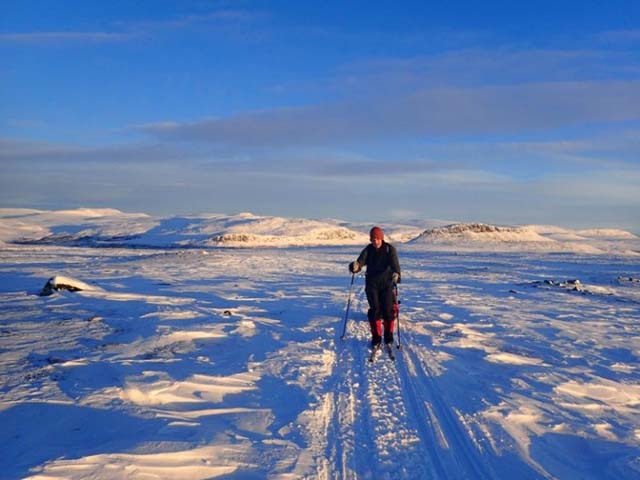 Bob from the Nature Travels team joined the Halti tour for Backcountry Skiing and Northern Lights in Finnish Lapland in February 2019. 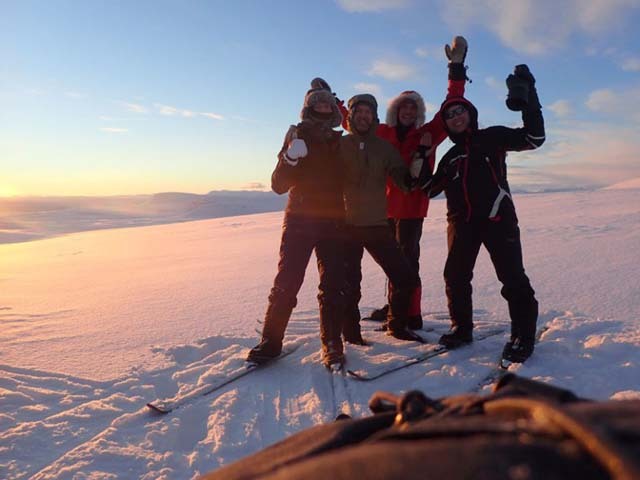 The Halti tour is one of the two itinerary options for this tour and takes place in exposed terrain above the treeline. A Lemmenjoki itinerary is also available, which runs in a landscape of boreal forest. 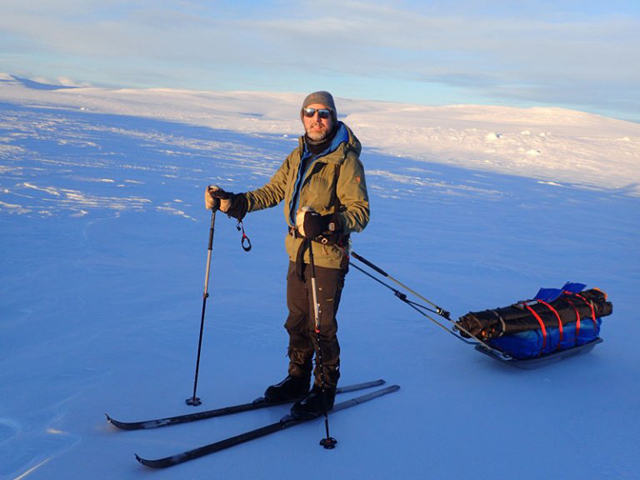 Running Nature Travels for the last 13 years, I’ve been extraordinarily privileged to take part in a very wide range of outdoor adventures, from extended canoe tours to mountain dog sledding, and have had some challenging and very rewarding experiences along the way. This time, I’d signed myself up for the Halti tour, one of the two itinerary options of Backcountry Skiing and Northern Lights in Finnish Lapland, which takes place right at the top of Finland in the Käsivarsi Wilderness Area near Kilpijsärvi, just across the border from Norway. I’m an active person of course and generally consider myself pretty fit, but I have to admit I did wonder whether I’d been a little over-ambitious putting myself in for what is probably the physically hardest of all the experiences we currently offer. This anxiety prompted me to do a bit of extra training in the couple of months leading up to the tour. So for a few weeks I was a regular source of entertainment for the morning dog walkers in our home town of Dorchester as I jogged round the park and lifted weights on the free outdoor gym equipment in the early morning mist! We were to be a relatively small group for this tour, just four in total with myself, Remko from the Netherlands, Vikkie from the UK and our guide, Joose. After a trouble-free journey, we met up without problems at Tromsø airport (in Norway) for the 2.5-hour drive across the border into Finland. The Halti tour is offered from New Year through to the end of March (with tours in April also possible for private groups – April can be a wonderful time to enjoy the “spring winter”, with snow conditions typically suitable for ski touring well into May), but as tours from December to February can often have a higher level of difficulty due to the likelihood of lower temperatures and possibly tougher weather conditions, the later part of the season tends to be the most popular. Lots to organise before we set off! Photo: Nature Travels. That said, those looking for adventure may well find it by choosing dates earlier in the winter, as we were doing! 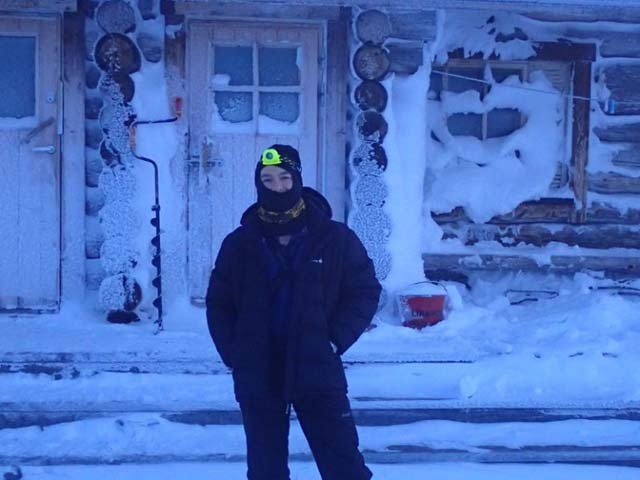 We arrived at the small village of Kilipisjärvi, atmospherically encased in snow and ice and a cosy -20 degrees, and entered the warmth of our little cabin at the hiking centre for the night. Here we were greeted with a beer (thank you, Joose!) and a light meal before we started on the job of getting organised with our kit. A while later, we had all been issued with sleeping bags (two per person, an inner down bag and outer synthetic bag), liner and boots. We discussed what clothing we each had with us and checked that gloves, etc, would be suitable for the trip. Then it was time for our last night in (relative) civilisation before we headed into the wilderness. 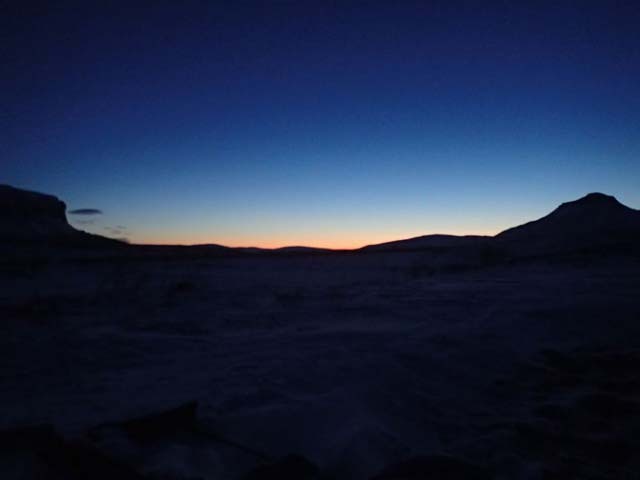 It was only just getting light, beautifully quiet and still and fairly cold at a bit less than -20 degrees as we packed the pulks and got everything ready for the trip. As four persons, we would be taking two pulks, each weighing around 35-40kg, and two backpacks, taking it in turns to pull a pulk or carry a pack during the tour. I hope someone knows where we are ‘coz I have no idea. Photo: Nature Travels. There was a lot to go into the pulks – food, camping equipment (although the intention is to stay in cabins each night, we would be taking two tents and related equipment as emergency back-up), snow shovels, spare skis and poles, sleeping mats, cooking stoves and fuel, food thermoses and extra clothing. In the backpacks we’d be carrying the things we needed to access quickly during the day, including down jackets for extra warmth during rest stops, drinking water thermoses and snacks. This doesn’t sound much, but the pack I would be sharing with Remko still weighed around 15kg by the time everything was in. We began with a steep uphill section through the trees – the last proper ones we would see for a while – and up towards the lake. Remko in best “arctic explorer” pose. Photo: Nature Travels. 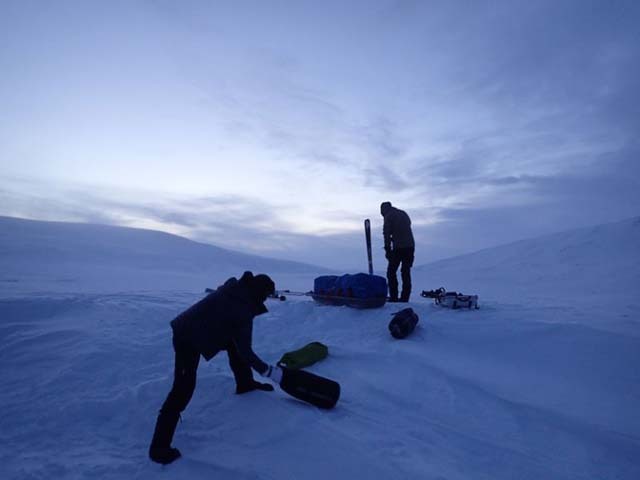 We soon learned that pulling a pulk up a hill is not easy – once your skis stop giving traction with normal forward skiing, you switch to “herringbone” steps. When that doesn’t work, you inch your way up sideways. And when that doesn’t get you anywhere, you take off your skis and walk. Fortunately, there should be at least one “buddy” available (the person carrying the pack) to help you up the hills when things get tough! 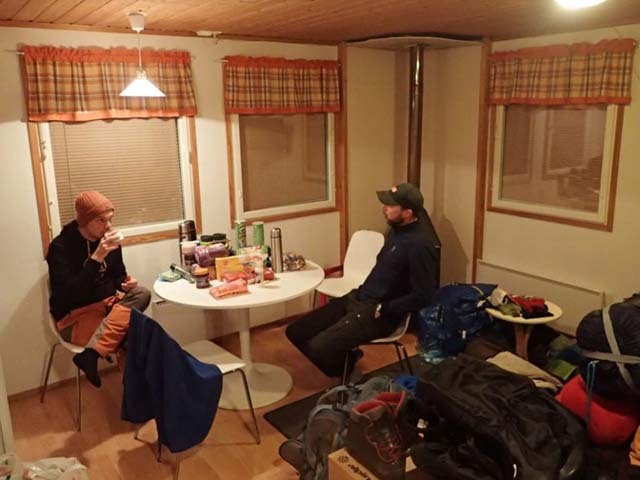 The first day of the tour is a bit of a baptism of fire, as you cover around 20km heading mostly uphill towards the wilderness cabin at Kuonjarjoki, so we felt we were quickly into proper expedition mode. It was windy and rather misty by the time we stopped for a “tea break”, and here I made a very silly mistake, something I should know better to avoid after all these years. Cold? Certainly not! 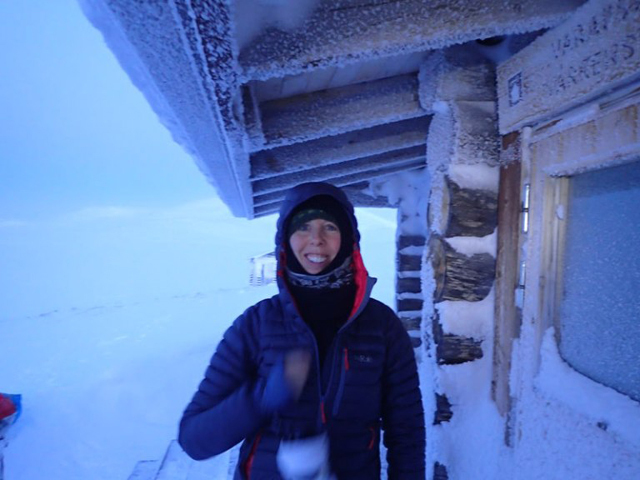 Vikkie wraps up for our first day in -20. Photo: Nature Travels. In preparation for the tour, I’d bought a pair of Army Surplus over-mittens to provide extra insulation and wind-proofing on top of my main gloves, and had to take these off to work with some straps. Instead of securing them to my wrists or stuffing them safely into a pocket as I normally would, I put them under my arm, got distracted, and dropped one, which immediately went billowing madly away in the wind across the snow with nothing to stop it between there and Norway! Joose, who still had his skis on, saw I’d dropped something and went sprinting off after it into the mist, but really it was a lost cause – the mitten was long gone. He chased valiantly and kindly after it for a surprisingly long time, but after a few minutes returned, glowing red-faced with exertion and empty-handed. Luckily, in this case it was nothing more serious than a minor inconvenience and a waste of £12 – fortunately Army Surplus kit is cheap! I still had my main gloves as well as spare gloves with me, and it was only an over-mitten in this case that was lost. 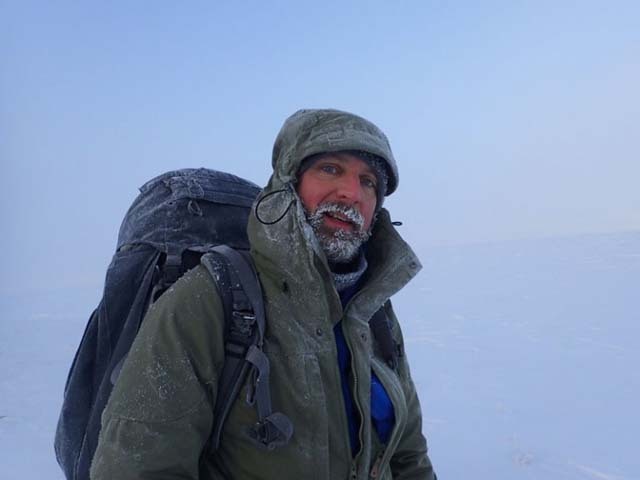 But on a remote expedition of this kind, with the temperature below -20, such mistakes can be potentially very serious – “lose a glove, lose a hand”, as the saying goes – and it was a timely reminder that we were in an unforgiving environment which you underestimate at your cost. 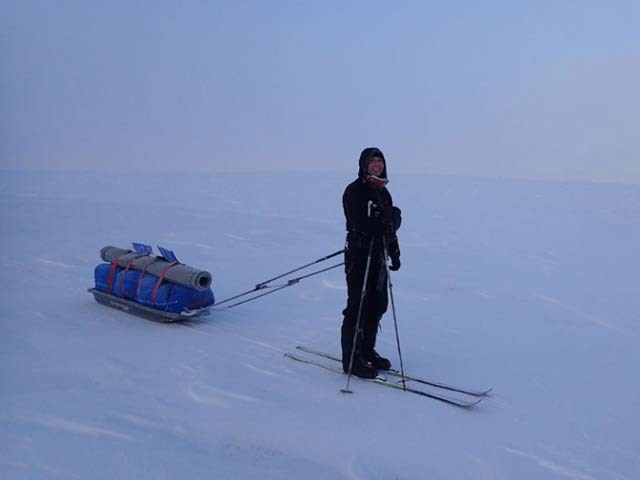 Joose takes his skis off for tea-break time. Photo: Nature Travels. It’s not often in the modern world that you get to feel properly hungry, but as we approached the lunch cabin after about 4 hours, having covered the first 10km, the morning’s breakfast calories had been well and truly burned off and I was absolutely ravenous! 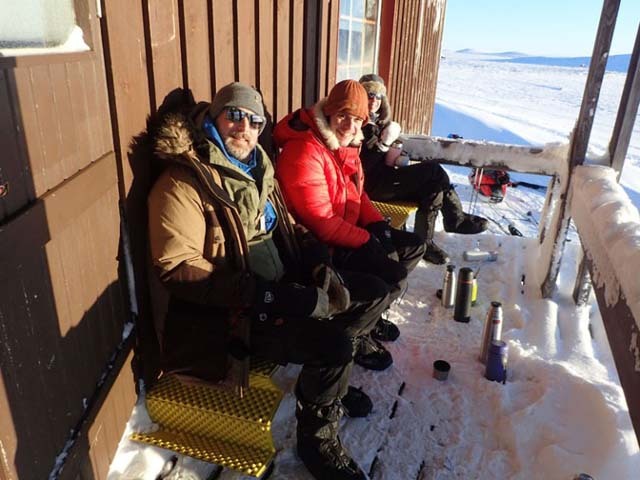 Once we were in the cabin and had our break jackets on to keep warm, I had just one thing on my mind – FOOD! And getting it inside me as quickly as possible. Fortunately, the delicious mushroom soup that we had with us for lunch this day, combined with a good handful or two from my nuts and chocolate stash, had my energy levels back up quickly. This was certainly needed as we continued the day with a steady but long uphill climb towards our cabin for the night. At this time of year the sun sets around 4pm and by 5pm it was time to turn on the headtorches to complete the last hour or so in the dark. Skiing in the dark is quite surreal – your world shrinks to a tiny circle of light, illuminating in this case the “Rab” logo of Remko’s pulk moving steadily along in front. It’s a strange, but oddly meditative, experience, as you slide along with no clue where you are, where you’re going or what’s around you. Joose at the front, though, certainly knew where he was going and at last our headtorches picked out the silhouette of the cabin, our shelter for the night. This evening was the first of many on the tour with a clear routine, one which we would get gradually slicker and slicker at over the coming days. Getting into the routine of melting now on our first cabin evening. Photo: Nature Travels. 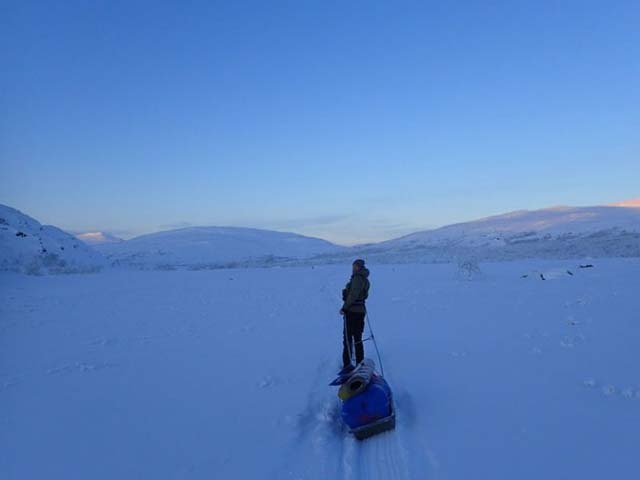 On arrival, you unpack the sleds and organise your kit, then get down to the business of melting snow. There are hardly any places during the tour where it’s possible to reach an open water source, so water for everything needs to come from melted snow. This is very time-consuming and really makes you appreciate what a very precious resource water is – you’re not going to want to waste any of it on pointless luxuries like having a wash or even cleaning your thermos! After the first in a series of surprisingly tasty re-hydrated dinners, Joose, both for some well-deserved privacy and also because he’s a superhuman breed apart from us lesser mortals, set up his tent to spend the night under canvas while we climbed into our sleeping bags. In theory, today should be an “easy” day, at least relatively speaking, but somehow it didn’t quite work out that way. 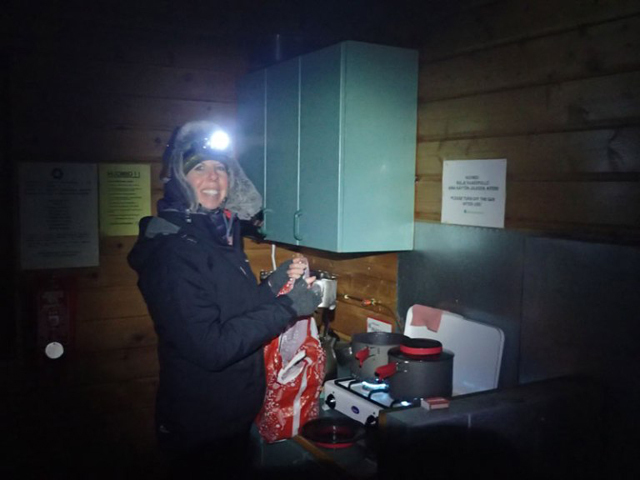 We breakfasted on porridge and crispbread (making sure to eat more than we had the day before, having underestimated the energy we’d be using), packed the pulks and headed off to cover the first 10km to the lunch cabin. As the skies clear, we get our first fell views as we drop into the valley. Photo: Nature Travels. The first half of the day went smoothly – a lovely flattish route along the plateau, with the last few kilometres dropping down into the valley. We had our first big views of the surrounding fells as the weather cleared, and our first experiences of negotiating steeper descents with the pulk and rucksack. It’s not easy to maintain balance and control on the downhills – if you’re carrying the rucksack, your centre of gravity is higher than you expect, while if you’re pulling the pulk, it builds up a good amount of momentum to push you along from behind. 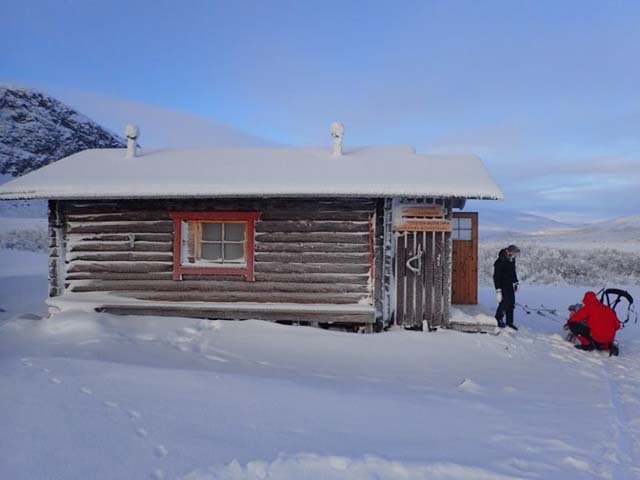 But with some determined snowploughing and taking things carefully, we all negotiated the hills well and we soon found ourselves at the lunch cabin nestling in the valley. 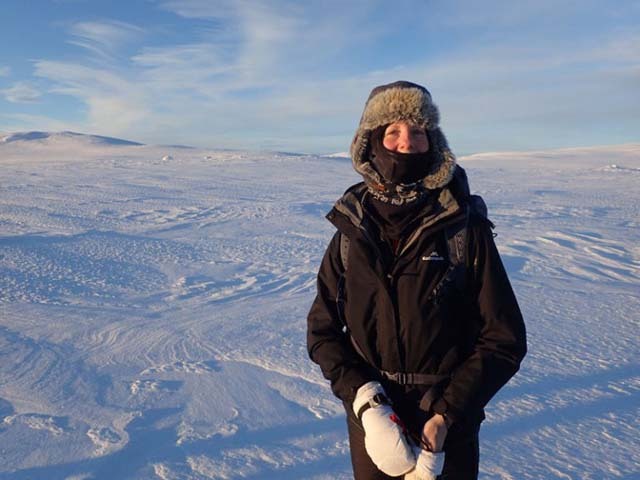 Having dropped a few hundred metres, it was immediately noticeably much colder here – about -27 degrees when we stopped for lunch compared to the -20 or so when we had started that morning. We ate our lunch in the cabin and pushed on. We had about another 10km to cover, the first 6km along the undulating valley floor, then a couple of km of steep uphill and the final 2km or so along a lake to the cabin at Pihtsusjärvi. Temperatures fall below -27 as we get to the lunch cabin. Photo: Nature Travels. For various reasons, the second part of the day proved to be a hard one! Fresh snow meant that we were breaking trail along the valley floor, making the going harder, and with the very low temperatures (-32 by the time we reached the end of the valley) the skis were gliding less easily than when temperatures are milder. 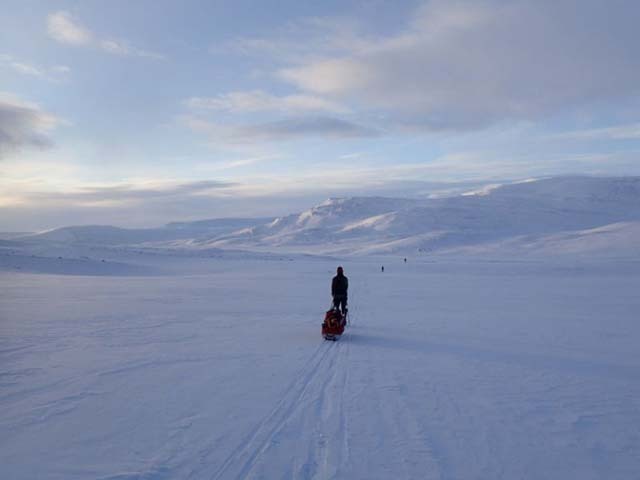 Remko takes the pulk as we enter the “Valley of Doom”. Photo: Nature Travels. With one thing and another, it was 5pm and dark by the time we reached the old police cabin at the end of the valley, with another 4km or so and a steep uphill still to go. We had a quick drink from our flasks, jumped up and down to shake the blood back into our fingers, turned on our headtorches and pressed on. We had a couple of km of steep uphill ahead of us, and teamwork was needed as we helped whoever was taking the pulk up the inclines. 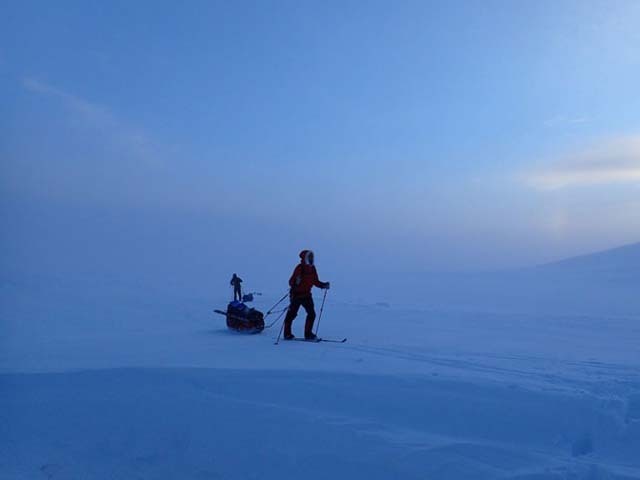 The fresh snow coupled with the darkness made this part hard going, and it was necessary to take the skis off and pull the pulk on foot up the steeper sections. On the bright side, we were no longer feeling the cold with the effort! After what seemed like an age we finally crested the hill, dropped down to the lake and had just the last flat couple of km to go. Even this part seemed to take forever, and we were almost starting to doubt that the cabin existed at all when at last we saw it loom out of the darkness. It was 7pm and we’d been going for over 9 hours, but we were there! 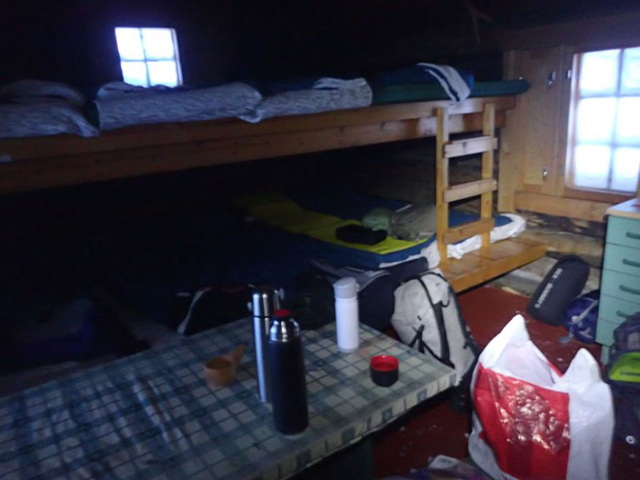 With the late arrival and various tasks to do around the cabin, it was almost midnight by the time we gratefully crawled into our sleeping bags. It had been a tiring day, but looking back on it, a wonderful one too. We’re there! Photo: Nature Travels. Earlier, Joose had called out encouragingly during our final exhausted trudge through the darkness, “It doesn’t get any better than this! You’ll be talking about this when you get home!” And he was very right – sometimes not every part of an adventure feels like fun at the time, but you’ll have some unique memories and a story to tell afterwards! Today really was an “easy” day, which we felt we deserved after our previous exertions and were looking forward to. 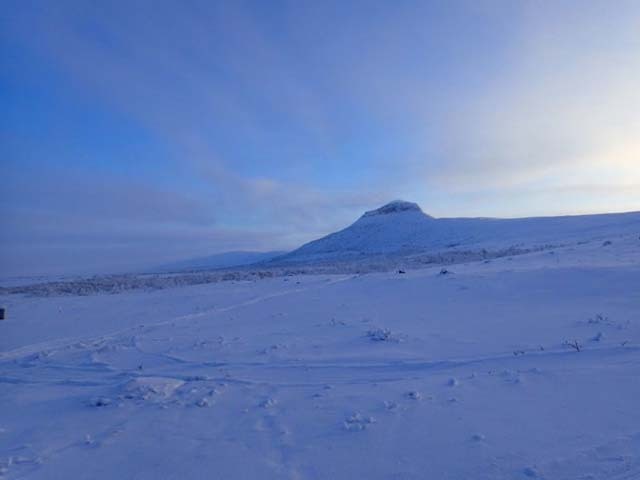 Today we’d be heading towards Halti, Finland’s highest mountain. It’s amazing what a good night’s sleep can do. We’re ready for the off again! Photo: Nature Travels. 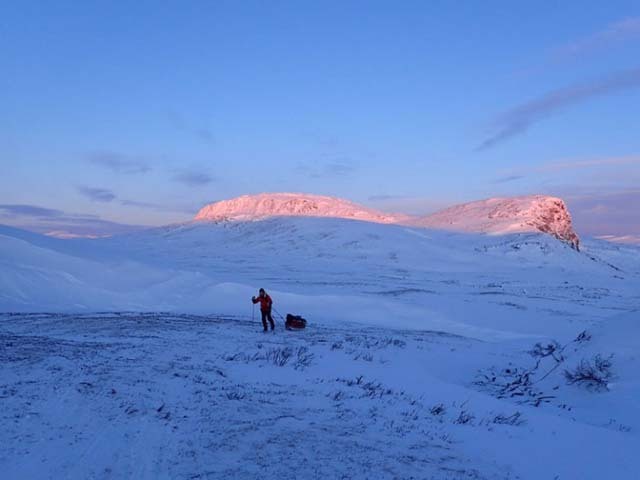 The first part was 7km uphill towards the Halti cabin. It was a beautiful day and the light was breathtaking as the sun rose and illuminated the surrounding fells. Bob keeping warm in the cold morning air. Photo: Nature Travels. There was no old snowmobile trail packing the snow down today to help us along, so we needed to break our own trail through the wilderness. While Remko took the bulk of pulk-pulling duty for the morning, I led the way (with occasional direction pointers called out from Joose further back) and it was an incredible experience to be out in front with the wide expanse of the fells spread out before me and no-one else at all in sight. Apart from the relative luxury of staying in cabins rather than winter camping each night (which of course would add further to the challenge, though there’s always the option to sleep in tent for this tour too if you wish! 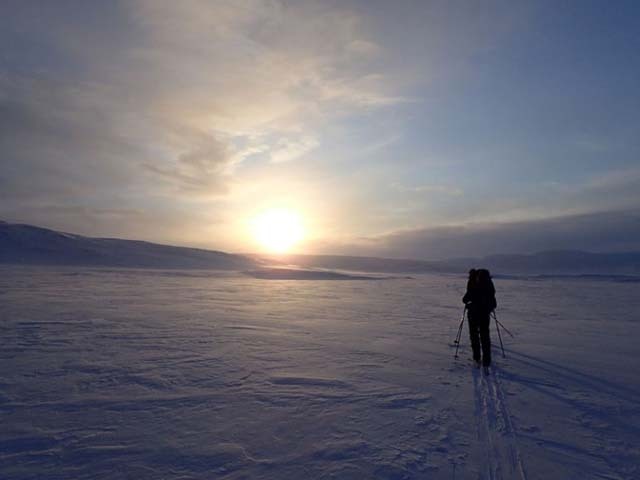 ), the tour is very much an authentic arctic experience and gives you a real sense of what it would be like to take part in a more extended expedition such as a traverse of the Greenland ice sheet. Breaking the trail through virgin snow with such beautiful views before me, I confess I did indulge a few “Bob Carter: Polar Explorer” fantasies as I skied along! Around lunchtime we reached the Halti cabin, at which point we would normally unload our gear and make an unencumbered ascent of the Halti peak, which takes around 2 hours up and a speedy 30 minutes or so back down. Enjoying having the world to ourselves. Photo: Nature Travels. But when it came to it, we all decided that actually what we’d really like to do would be just to enjoy life at the cabin for the rest of the day! 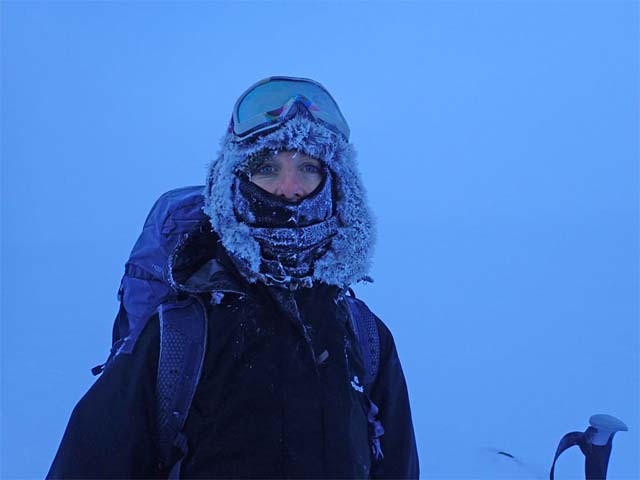 The weather had changed anyway, with much reduced visibility now, and while the ascent of Halti would still have been safe and possible, it would not have rewarded us with a view. With our late arrival at the cabins on the two previous evenings, we felt it would be really nice for a change just to kick back for a few hours and soak up the atmosphere of this lovely cabin, an old border patrol station. So that’s what we did. Personal challenge, testing yourself, reaching a goal, a sense of accomplishment, stepping outside your “comfort zone” – all these are valid reasons to come on a tour of this kind. But probably the most important of all is simply because it’s fun! 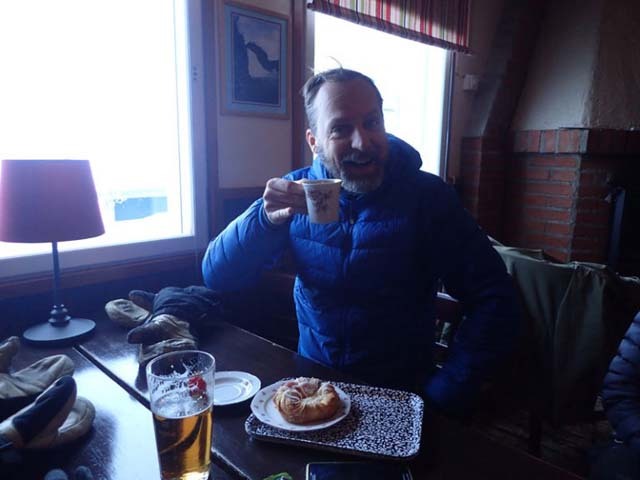 And while the challenge of the skiing is of course a central element of the trip, so too is the experience of cabin life and all that goes with it and the joy of just “being” in the outdoors. So for this afternoon, we put aside our egoistic ambitions to “bag the summit” and opted for a restful and very enjoyable few hours sitting by the fire, talking, joking, and eating more or less constantly. That’s another wonderful thing about this tour – you can eat as much as you like with a completely clear conscience, safe in the knowledge that you’ll be burning it off. I stuffed myself silly for the whole week and still managed to drop 2kg! 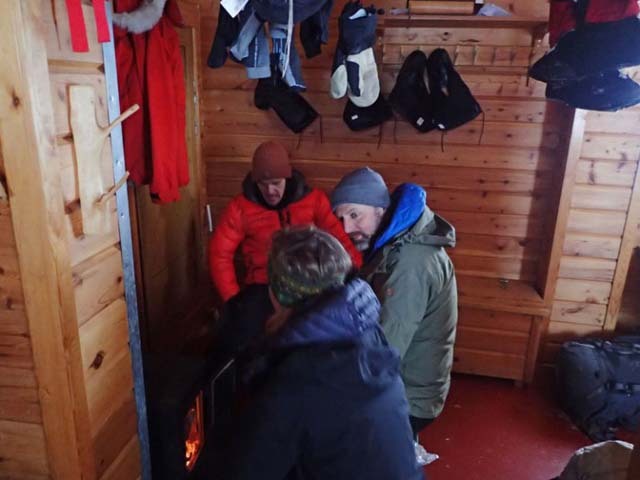 It was a relatively large cabin with a correspondingly small stove, so even after seven hours or so with the fire blazing, we’d only managed to inch the inside temperature to a couple of degrees above zero. Strangely, that felt quite toasty! Even a trip to the outhouse can be an adventure. Photo: Nature Travels. 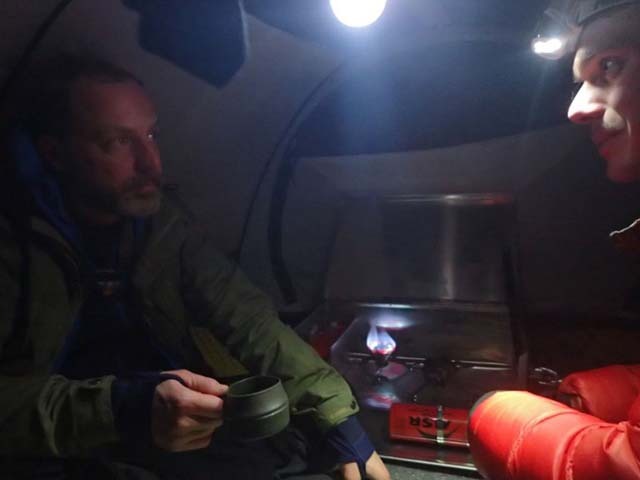 None of us had taken up the invitation to sleep in tent on any of the nights during the tour, but to tempt us under canvas for a while and demonstrate how warm and comfortable winter camping can be, in the evening Joose invited us into his tent for hot chocolate. With the camping stove on (using a stove inside a tent in this way requires specialist knowledge to do safely – but fortunately specialist knowledge is something Joose has plenty of! ), it was roasting in there and we passed a happy hour or so huddled inside before retiring to our cabin beds. Tent life. Photo: Nature Travels. We had about 17km to cover this day but we would be heading downhill for most of it – 7km back towards the cabin where we’d stayed two nights before, then a revisit to the “Valley of Doom” (as I’d come to think of it my head following our chilly experience there) to overnight at the cabin where we’d had lunch on Day 3. Packing in the morning light. Photo: Nature Travels. We were blessed with another beautiful day – clear skies and no wind. 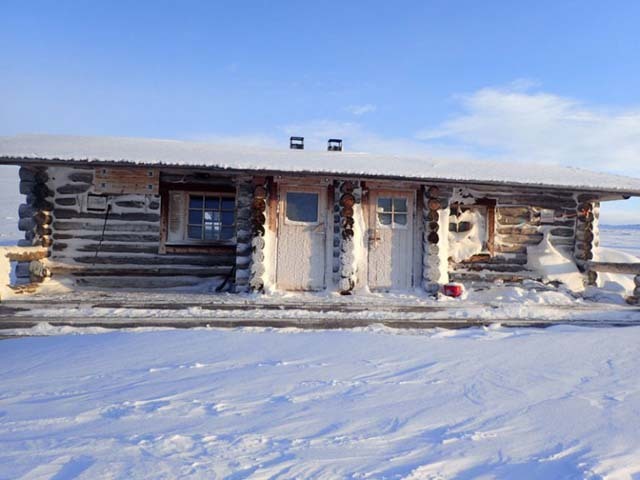 It was a milder -15 degrees or so up at the Halti cabin when we left, but the temperature would drop during the day as we descended. Skiing into the sunrise. Photo: Nature Travels. It was glorious to ski down the way we’d come up the previous day, with a new view to greet us as we headed in the opposite direction. These mountains really are magical and, especially being out relatively early in the season as we were, the sense of isolation is pretty much total. We were all alone in a huge white wilderness, and it was wonderful. Glorious mountain views for our descent. Photo: Nature Travels. It was an odd feeling to arrive back at our Day 3 overnight cabin, which was now bathed in midday sunshine like an alpine ski chalet. We’d only seen it in the dark – when we’d arrived tired and hungry and in the dawn half-light when we’d left a couple of days before. Great to see this cabin in daylight at last! Photo: Nature Travels. After lunch we set off across the lake, which this time looked much more inviting than it had at night, with a view across to some cabins used by Sami reindeer herders when the reindeer are grazing up here in the summer. The downhill section to the valley floor was great fun. Seeing how long and, at times, steep it was made us realise why we’d found it a struggle coming up. Perhaps it was a blessing that it had been dark and we couldn’t see what we were in for! Down at the police cabin, the valley felt very different to the last time we’d passed this way. Last time we were here it had been -32 and as soon as I’d stopped moving it had felt like the freezing air was sucking the life-force out of me like a Harry Potter Dementor. Though still fairly cold, now the valley felt soft and welcoming in the afternoon light, and we enjoyed negotiating the ups and downs (including a spectacular face-plant in the snow from Remko at one point during a steep downhill bit) as we made our way the 6km or so along the valley to the cabin. We arrived just as the sun was setting, providing a magical end to the day. Sunset at our cosiest cabin on the trip. Photo: Nature Travels. All the cabins had their own special charm, but this one was probably my favourite. Really small and cosy (and consequently very easy to heat), it was the ideal base for a sociable and fun evening during which Joose taught us one of his card games, “The Great Dalmuti”. Naturally, we also ate a lot. To round things off, the Northern Lights came out to play and for a while we stood out in the cold enjoying the curtains of light waving across the sky. 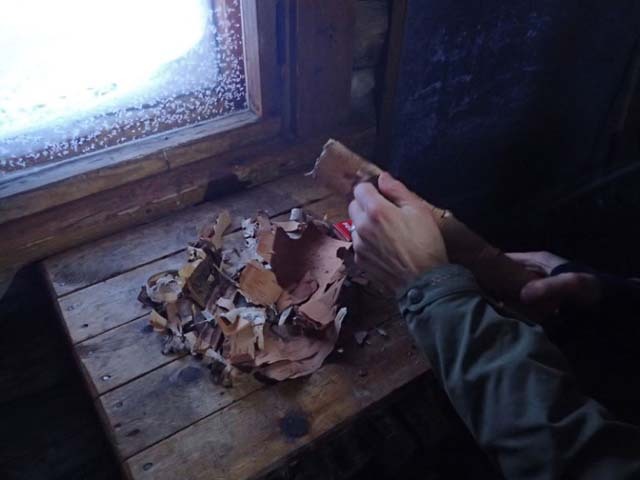 Birch bark makes a wonderful firelighter. Photo: Nature Travels. Following the normal itinerary, this should probably be the hardest day of the tour, both because of the extra distance (about 23km) and because you head away from where there’s likely to be any packed snow from snowmobile trails, so will normally be breaking new trails all day. But we’d elected for a slightly different option, taking us for the first half of the day back up the long hill towards the cabin we’d stayed at on Day 2, with our final goal for the day being our lunch cabin from Day 2. This would still give us a good distance to cover for the day, about 19km, and we’d probably be doing more climbing than we would have done on the “normal” route for this day, but with a trail to follow (at least for the morning) it would reduce the level of challenge a little and also give us the option for a scenic “up and over” route variation in the afternoon to reach the overnight cabin and a few km shorter for the next and final day to get back to Kilipisjärvi. It’s going to be a beautiful day! Photo: Nature Travels. Yet again the weather was being very kind to us and we were rewarded with stunning views as the sun rose over the mountains. Climbing out of the valley. Photo: Nature Travels. 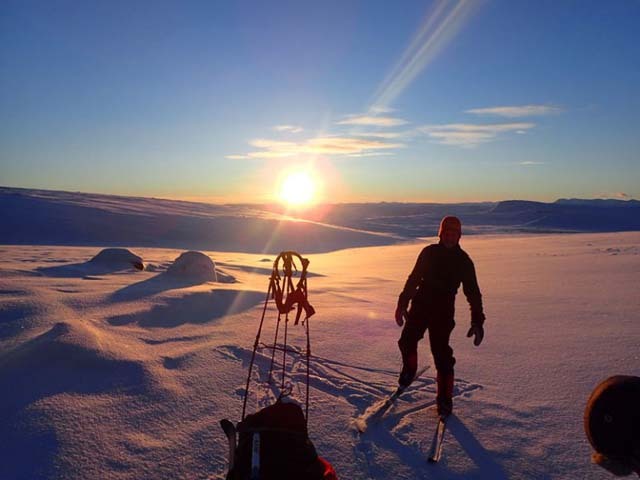 After four days as arctic adventurers, it felt like we charged up the long climb out of the valley – I thought as we went how much harder we would have probably found it had we done this stretch earlier in the week. Across the plateau. Photo: Nature Travels. We had better visibility than we’d had when we last passed this way and it was lovely to see the wilderness stretching to the horizon as we made our way across the plateau. The veranda at the lunch cabin was bathed in sunshine and so this time we felt even more like we were on a ski holiday in the Alps as we took our lunch outside in the sun. Hard? Who said this was hard? Photo: Nature Travels. The afternoon would see us heading into new territory, breaking a trail along a lovely U-shaped valley with a traverse up the side to reach a plateau, from where we’d descend to our cabin for the night. Remko prepares to take on the hill. Photo: Nature Travels. 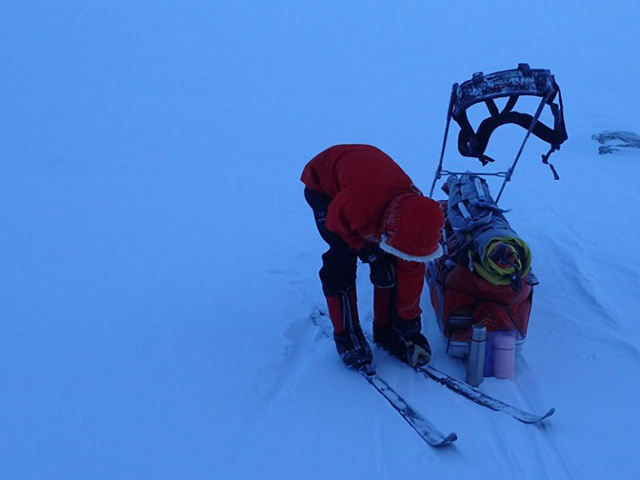 Remko seemed possessed with unstoppable energy as he forged up the hill with the pulk in tow. “We’re on top of the world!” Photo: Nature Travels. Just beautiful. Photo: Nature Travels. Scenically, this was probably the highlight of the tour for me – the sun was going down as we started the long gentle descent towards the cabin, the snow fields were sparkling and the mountains glowing yellow and gold. I don’t think I’ve ever been anywhere more beautiful in my life. And so our last full day of the tour was over. 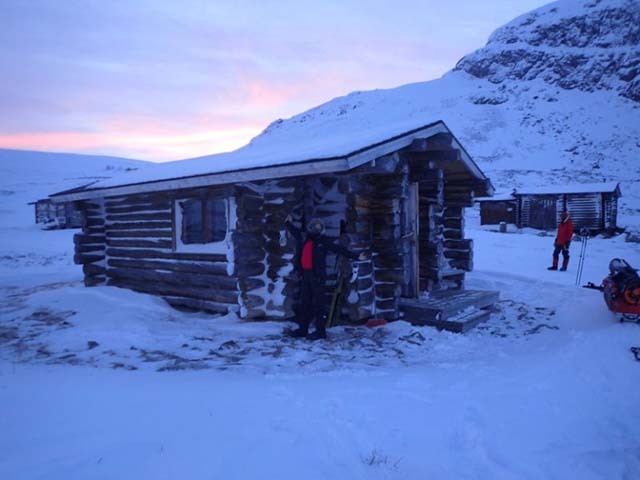 We were now just 10km from Kilpisjärvi, and being close to the village and so ideal for a short overnight visit, this was the only cabin during the tour where we met any other travellers during our week in the fells. But although we’d almost come to think of the mountains as “ours” and it seemed somehow strange to be suddenly sharing them with others, it was also nice to feel that we were on our way home. Arctic Adventurers. Photo: Nature Travels. 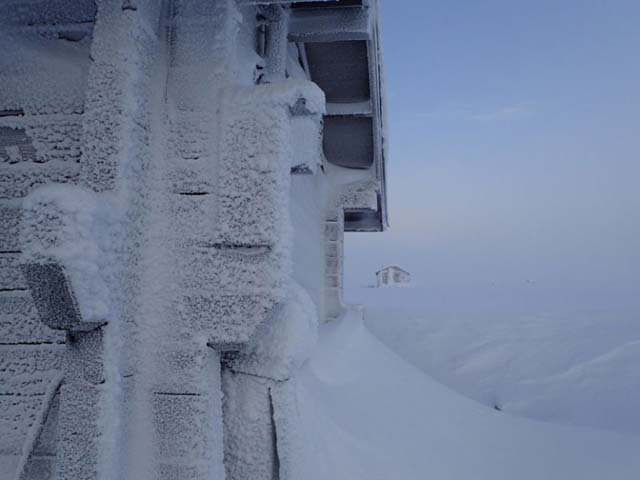 The normal route this day would be around 15km back to Kilipisjärvi, but from this cabin we had just 10km to ski. Our adventure was coming to an end. There we would spend a night in comfortable beds before heading back to Tromsø for our onward journeys the next day. Joose had been dangling the psychological carrots of sauna and beer in front of us for a couple of days now, and we sped home to enjoy them. Down the hill, along the lake, and a few hours later we were back below the tree line with the lights of Kilpisjärvi twinkling beneath us. There’s no doubt that a shower, a sauna and a beer (or two) are unbelievably welcome to come home to after a week in the wilderness, and it felt wonderful to be back. But there’s another side to this: when the initial glow of feeling clean and the awe of such modern wonders as running water and flushing toilets (plus, as Remko insightfully remarked, the luxury of a seat that supports your back!) has worn off, you quickly find yourself longing again for the simpler pleasures of the wilderness, where as long as you have warmth, food, shelter, and the company of friends, there’s pretty much nothing else you need in life to be truly happy. Perhaps back out there is where the “real” world is. 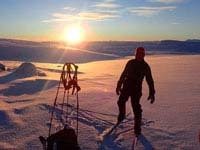 Nature Travels also offers ski touring in Sweden and Norway and additional options for cross county skiing in Finland. See our Ski Touring and Cross Country category for details.